The route is very easy to find and follow. 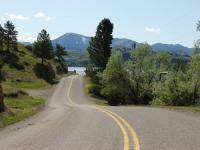 Just start Cascade, MT and take US 91/Frontage Road that parallels the river and the freeway (I-15). Take it all the way west till you come up on Beartooth Road (just before you go over the large bridge crossing the river) and take a left to Holter Lake. Follow this for about 2 miles and you'll be dropping down into the valley of the lake. When you're done, you can head into Wolf Creek by back tracking to Frontage Road and taking a left and you'll be in town very quickly. On this route you'll travel along the Missouri River Valley where the road hugs the river and you get some fantastic views of the rock cliffs and outcroppings that surround the river. It goes from good to great as you make your way into the Holter Lake area and take in this magnificent lake. The road conditions are good the whole way. The road is a series of gentle turns and modest elevation changes and there really are no switch backs or anything intense so I gave it a 3 star rating. The cruisers and winger crowds will love this road and probably rate it at a 4 or 5 but sport bike types will consider it a nice 3 star. There are a small number of restaurants along the way that you may want to check out but I'm thinking they may only be open on the weekends in the summer. One nice one is in Hardy (pictured). When you get to the Holter lake area, there is only one restaurant there. While you are at Holter lake you should check out the little park there as it has a couple of areas you can picnic at and take in the awesome scenery. When you're done on this trip, I suggest you go into the town of Wolf Creek and gas up and you can eat at the little grillice cream shop or the restaurant bar (the weekend I was there, the front was lined up with bikes). I took this route back in 2008 and it was a great one. Holter Lake is a tucked away little gem just outside of Helena. It has a camping/pic-nic area and is a nice little stop at the end (or start) of this ride. The rest of the ride meanders next to the Missouiri River with great views of interesting rock formations along the way. Its a great relaxing ride with enjoyable & changing scenery the whole way! !